The substantial second lighthouse was a fine example of a cupola lighthouse. The first lighthouse, lit in 1879. 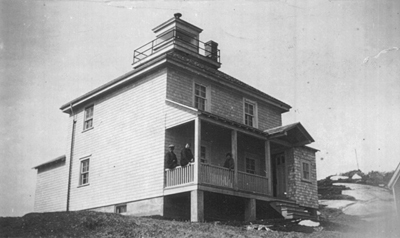 The lightstation showing the second lighthouse, and the first lighthouse converted into an auxiliary building. 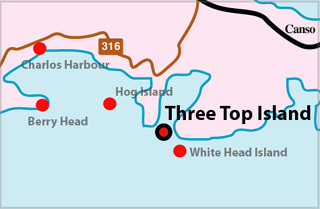 The light station at Three Top Island was established in 1879. NSLPS has kindly been provided with photographs of the station by a descendant of Keeper W.L. Munroe. The date of c.1930 for this second building is conjectural because more research needs to be done for this light station. To read a letter written by Keeper W.L. Munroe, giving some of his experiences, click on "Lightkeeper." Allow me space please in your valuable paper to insert a sketch of my past thirty-two years as a light-house keeper on what is known as or called by mariners "Three Top Island," which lies at the west entrance of Whitehead Harbour, one mile from the mainland, being W.N.W. from White Head light, distance one mile. The light is called a harbour light, but [it is] not like many harbour lights on the coast, whereas most such called lights [are] attached to the mainland. This island takes its name by having three hills as nature formed it, each hill or peak running eighty to a hundred feet horizontally, with no real landing place such as a beach. It is iron bound all around, with a boat slip running down a step embankment where with a block and tackle attached to a capstan fixed in a boat house on the side of the cliff, we haul our boat to safety. By times, when there is a heavy sea on, [it]is a pretty risky piece of business. Many times I have had my boat filled in effecting a landing. Well, Mr. Editor, the life of a lightkeeper is a dreary one, watching the storm-tossed seas that I have witnessed time and again caused by heavy winter gales on the southern coast of our Province, facing the Atlantic Ocean. I remember one storm in particular about 18 years ago in February. The sea in one of its fierce rushes bursted our door at ten o'clock at night and flooded our floors to a depth of six inches of water. My wife and the children screaming, thinking they were doomed. I got them gathered to a window, there to make our exit and flee to one of the highest peaks, but in this case Providence favoured us by the gale moderating and the sea falling some, did not cause us to face such an ordeal in a winter's hurricane on a naked cliff. Also, Mr. Editor, I could relate several cases in sheltering ship-wrecked crews since my abode as light-keeper, if space could afford. One case in particular I must relate. It was on a Christmas eve about 16 years ago, if I remember right. There was a heavy gale a raging from the NE, with snow and the temperature was at zero. My three eldest daughters were on the mainland at the time attending a concert at the Methodist Church. The small children had retired early in the evening as usual. My wife and I went to bed about half past ten o'clock after seeing that Santa Claus was to visit the island, and I suppose we had been retired about 20 minutes and I had about fallen to sleep, when my wife aroused me by telling me that she heard a horn blowing. I told her she was dreaming, to go to sleep; but to please her I got up and went to the door to investigate. I found to my horror that she was right, for there on the reef that extends SE away from the mainland about two hundred yards, lay a stranded vessel and they were blowing horns and shouting for their lives for the keeper to save them, as they thought from the way their ship was pounding she would break up, and certainly they would be doomed under such circumstances. Well, my man being ashore to spend his holidays of course left me alone. I dressed and went to the cliff, as near as I could venture and shouted as loud as I could as I could not attempt it until daylight. Well I don't suppose they could hear me, but dear; their wailings were terrible to hear on such a night. And again I went and shouted to them to take their own boat and I would guide them by a torch. Well, again they could not hear me, as they kept up their wailings. I could hear the wind whistling in the wreck, but I leave that to one's imagination, what it sounded like, together with their shoutings to save them. Well I went to the house and told my wife that in God's name I would try and launch a boat and go off to the wreck, and of course, as usual with women, my wife crying and begging me not to dare such a thing on such an awful night, and the children awakened by the tumult to make matters worse joined their Ma in begging me not to go, and I was pretty near abandoning the idea altogether until daylight. Well, I went out of doors and down to the cliff, and by the way their shoutings seemed to me, I imagined there were at least some of them in the water, and perhaps drowning. And then I said to myself "I am going to try it anyway and if I get lost it will be in a good cause trying to save my fellow men". Well, I lit a fine torch, or flare up, as some call them, and my wife following me, I went to the slip and let the boat down, as far as I dared. the sea was coming up by times half way to the slip. As the gale was blowing fair on it was so much the worse to get clear. I was about to run down and after lowering her and did unhook the boat [when] there came a heavy sea and swept the boat clear of me just as I was in the act of leaping into her. She turned completely bottom up. Well, that pretty near discouraged me. However, I had another boat in the store that I had stowed away since the past summer not intending to launch her until spring lobster fishing. To her I ran and got her on the slip but having only one pair of oars left, it was risking losing two pairs on the first boat. However, I let the boat down part way this time, put my oars in her, unhooked my tackle and sprung into the boat, taking chances going down the slip equal to "loop the loop"' and landed safe in the boiling water made by the gale. I grabbed my oars and as skilfully as I could, managed my boat until I got out to the wreck, which I found to be the George P. Trigg from Charlottetown, P.E.I., bound to Boston, loaded with several thousand bushels of oats. She was trying to make the harbour to clear the storm when stranded. They had lowered the boat when first she struck the ledge and lost the boat in the sea. I found the men very much frightened. They all wanted to get in my small boat at once, but I told them to do as I told them and I would try to land them. So I took three men at a time getting to the island. My wife held the torch and that was a great help to me. I backed the boat stern-first as near to the surf as I dared and told the men to leap which they did, and landed safe, and then I began another struggle for the wreck, which I gained after a hard fight and got the captain, mate and the remaining one of the crew. I dared not allow anyone to touch my oars by myself as I had only one pair and to break one we were doomed. However, I reached the island and landed safely, thank God, where we were all housed at 3 o'clock in the morning on Christmas Day. The wreck presented a gloomy-looking sight in the morning. The top of the hull, which was above water, was a mass of ice, where no one could go near her for a couple of days. I can vouch, also, for keeping five wrecked crews for over a week at a time. All for which I have never received a cent. Although I billed parties, I was never recognized after. My family consists of ten children, seven girls and three boys, of which two died young and one girl died also. After reaching womanhood four reside at Somerville, Mass., the eldest Mary marrying Mr. J.D. McLean, a contractor in the team fitting business. The next, Alice, a music teacher, lives with her sister. Edith also lives with her sister, and their next youngest sister is attending high school in Somerville. My salary had been very small. After paying a man and feeding him at the high cost of living, three hundred dollars does not go far. Now Mr Editor I will conclude by saying to give me justice don't you think that I am worthy of a superannuation fund when I leave this Island which I suppose will be very soon now. Thanking you kindly Mr. Editor for your space allotted. (Of course Mr. Munroe will be superannuated. The Dominion of Canada cannot afford to do its housekeeping by turning off old servants who have served it so gallantly for so many years, without anything to live upon so far as the country is concerned.